Make Your Business A Success – More than 43,000 sold! Get everything you need to know about the specialty food industry in this comprehensive how-to guide. 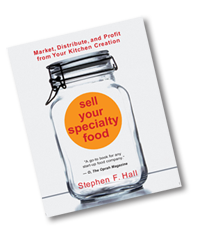 Author, Stephen Hall, outlines every food marketing opportunity and then supports entrepreneurial action with detailed guidance. Whether you own a business or you are thinking about starting one, Hall will show you how. Included is up-to-date information about the role of the Internet, health and organic food markets, the latest government regulations and technological advances, and contact information for dozens of valuable resources. Order the book, study it. If you need more support, we can assist you further with our “How to Succeed in Specialty Food Marketing” business coaching. – Cameron Wold, Boise State University, Idaho SBDC. “I was struck by so many positives: The clarity of your writing; the wisdom of your advice; and the practical tools you offer. You know how many times I am involved in a conversation that starts something like this: “My wife is a great cook, and we’d like to market her specialties!” Now, I’ll have your book at my fingertips to more comprehensively be a guide. From Library Journal – How many of us have toyed with the idea of selling our favorite family recipes? The growing number of specialty food products on the market strongly suggests that people are doing more than just toying with the idea. 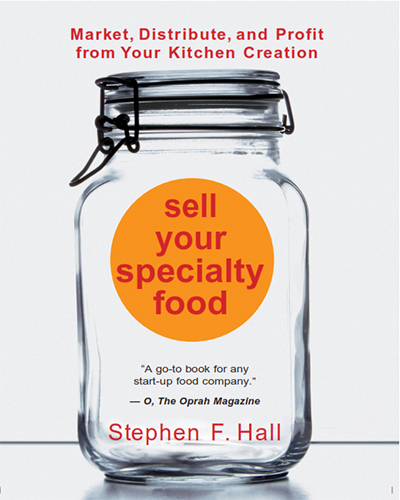 Hall, a food industry consultant, has created a thorough guide to food marketing that is sure to help food entrepreneurs at all levels, from the rank beginner to the most experienced. Hall clearly points out possible pitfalls and concerns as he takes the reader step by step through the entire marketing process, offering guidelines on market research, packaging, pricing, and advertising. Interesting vignettes on actual successes and failures allow a realistic view of possible scenarios. The appendixes, which make up a good portion of the book and list trade shows, journals, associations, sample forms, and so forth, are a terrific quick resource that significantly enhance this already strong and well-written guide. Strongly recommended for public and academic libraries. – Margaret B. Bartlett, Rochester Inst. of Technology, N.Y. Copyright Reed Business Information, Inc.
Tutor in Print for the Aspiring Gourmet Food Marketer.